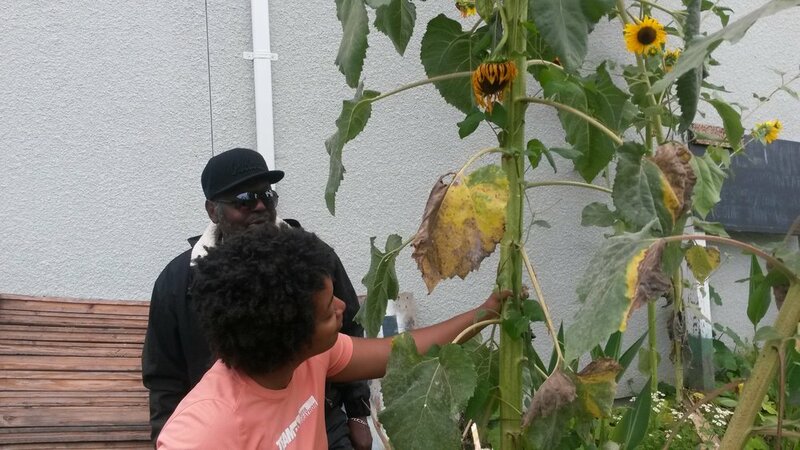 The Fruitvale Community Garden, while not an official Oakland Power Project, got off the ground during the latter-half of the Stop the Injunctions campaign (STIC) while Critical Resistance was developing the Oakland Power Projects (OPP) model. This project, in hindsight, flowered as we intend OPP to do: by assessing community needs and building the resources, relationships, and practices that actually keep communities safe and strong while debunking that safety and wellbeing depended on law enforcement and pro-policing policies. The garden was started in the political spirit of "Our Oakland, Our Solutions"-- the rallying call of the STIC and the motto which informed OPP, see poster at bottom-- as city decision-makers dragged on making the investments and decriminalization policy changes that reflected the actual needs of Oaklanders. 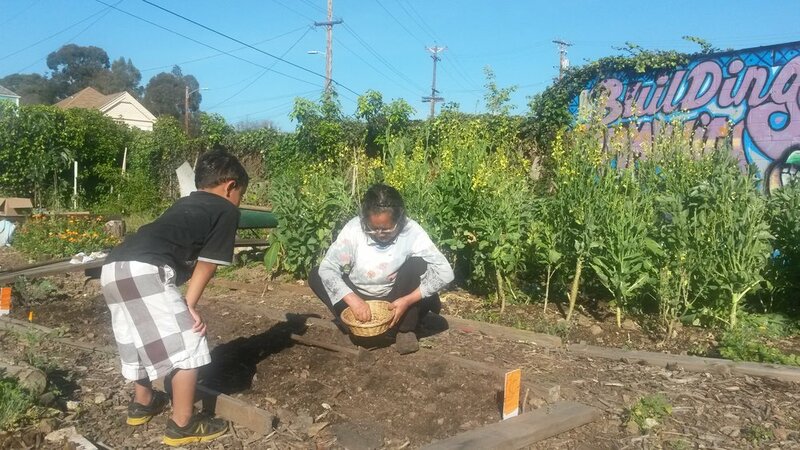 In response to a partnership request from people targeted by the Fruitvale injunctions, Critical Resistance members joined forces to cofound the garden and build it from the ground up. From 2013-2015, while CR was doing our first rounds of OPP community interviews, this "alternatives to policing" space took root and flourished. As you will read below, the garden centered longtime community members and people targeted by policing. The garden's existence and leadership debunked the fear-based austerity policies and divestments that Oakland decision-makers put forward about who belonged in Oakland, who deserved community roots, and what resources and practices keep the Fruitvale thriving. The Fruitvale Community Garden is a space for community members to grow food and enjoy as a green and vibrant place for community-building and relaxation. The garden was started from the grassroots by a group of lifelong residents, neighbors, friends, and organizers involved in Stop the Injunctions Coalition (STIC) who wanted to build a resilient, life-affirming public resource that would highlight principles of community health and self-determination. The garden was developed in collaboration with some folks targeted by the Fruitvale gang injunction who wanted to counter the punitive, fear-mongering rhetoric of politicians and police and build solutions from the ground up. We envisioned that an empty plot overgrown with weeds could be an asset rather than an eyesore; all it needed was some attention, some hands-on work, some plants and dedicated people to turn it into the beautiful space it is today. Land is an important element for community stability. We believe that people in Oakland should have access to free and public spaces. We stand strong against gentrification and displacement. The vision of this garden builds on the momentum of STIC and Atzlán Beautification Movement to work with our community, by and for our community to build our own short-term and long-term solutions for safety, wellbeing and freedom. This garden is an important resource in the Fruitvale because it is a thriving space for neighbors of many generations, ethnicities, and languages to get to know each other and, together, to build a place that provides for our needs. A healthy community is a safer community, and we believe that real safety comes from abundance: healthy relationships, stable housing, healthy food, and green spaces. We want this garden to be maintained as a spot for community-building and for food production, for rest and for art-making. 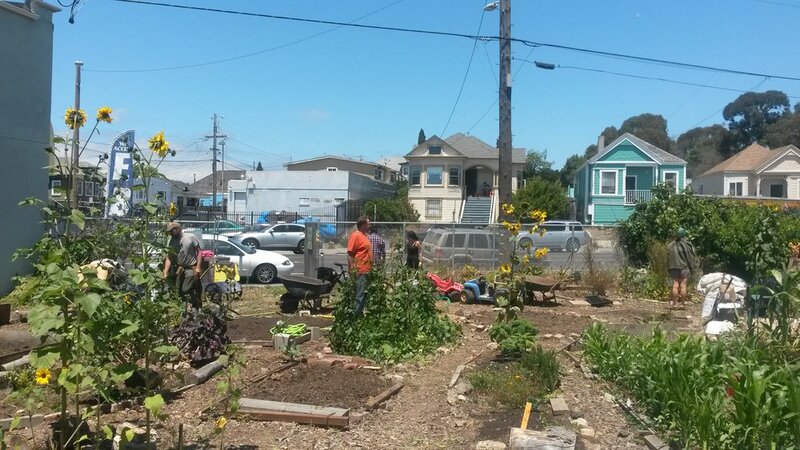 This garden is a real resource for community health, for a beautiful Fruitvale. While not explicitly an anti-policing project, the Fruitvale Community Garden is a community-based resource that actually facilitates what policing claims to deliver and rehumanizes the people that policing targets to dehumanize, displace, and discard. The garden became a model for the Oakland Power Projects: how to seed resources that reduce our reliance on policing as the answer to community needs.